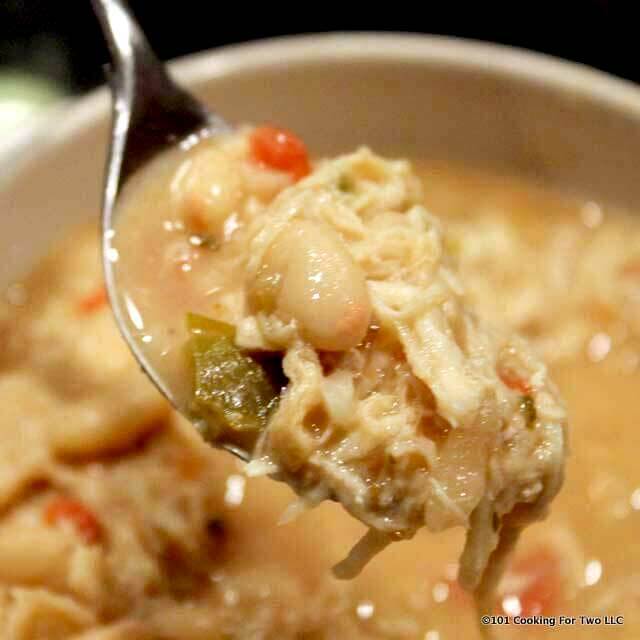 This is the EASIEST crock pot white chicken chili recipe you will ever see. Dump, dump, dump, then cook for 4 hours. You are rewarded for your laziness with a great chili, and all your friends will demand the recipe. Publisher note: Originally published March 2, 2010. It was first published the third month of this blog, and maybe 50 people saw the first post. It has been republished once in 2013, which is five years ago. This wonderful chili has always been one of my most requested recipes. Anytime I take it to gatherings, I take copies, so I don’t have to write it down. Please enjoy some great chili. No “inspired by” recipe here, I have done this one for 30 years plus. I even remembered the recipe without looking it up. And my memory is going. An absolute 5. No doubt about it. Get your chicken any way you want. 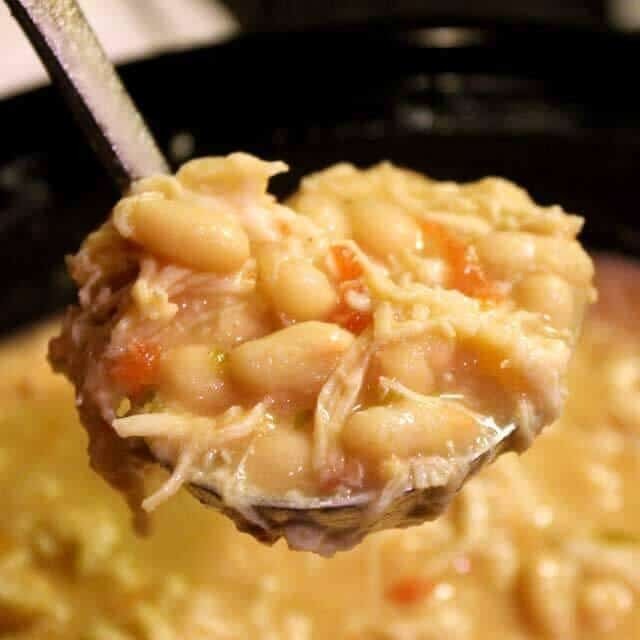 My crock pot shredded chicken recipe is where mine came from after a one month stay in my freezer. 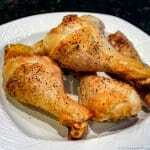 A rotisserie chicken, canned or frozen. Or cook a couple of breasts in the oven until done (about 350 for about 40 minutes). 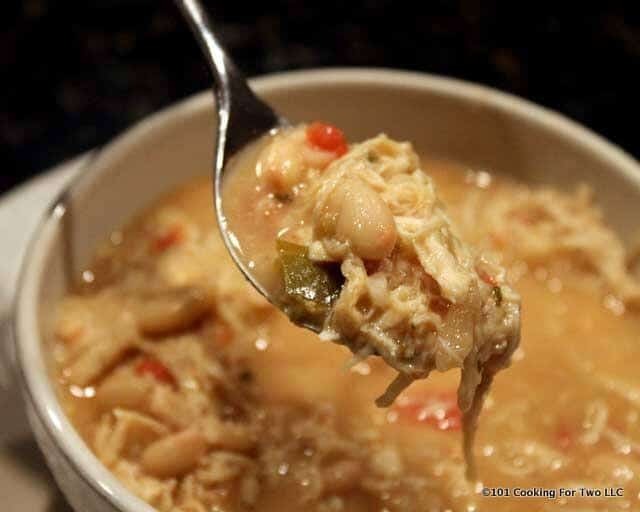 Thickness: I like my chili a little thinner now, so I added an optional can of chicken broth. But leave it out, and you have a spicier very thick chili. Spiciness: The spiciness is a 4/10. You can adjust that up and down. First is the pepper jack cheese. 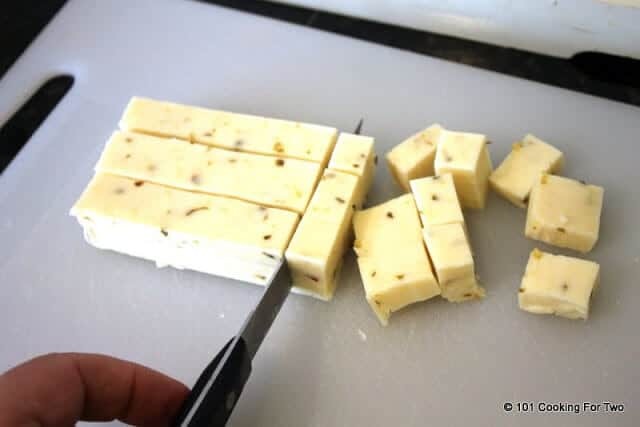 Pepperjack cheese is Monterey Jack cheese that is flavored with spicy chili peppers and herbs. So just using Monterey Jack instead will kick it down a few notches. I recommend medium salsa so that can be moved up or down. And lastly, the cumin can be adjusted. This chili holds its physical heat for a long time due to the cheese. That makes it great for a party even if you can’t plug the crock pot. A few simple ingredients. Get your chicken any way you want. I frequently will bake two skinless chicken breast at 350 for about 40 minutes until 165 degrees internal temperature. Rotisserie or leftover chicken works great. You will need about 3 cups. Cube 8 oz of pepper jack cheese. 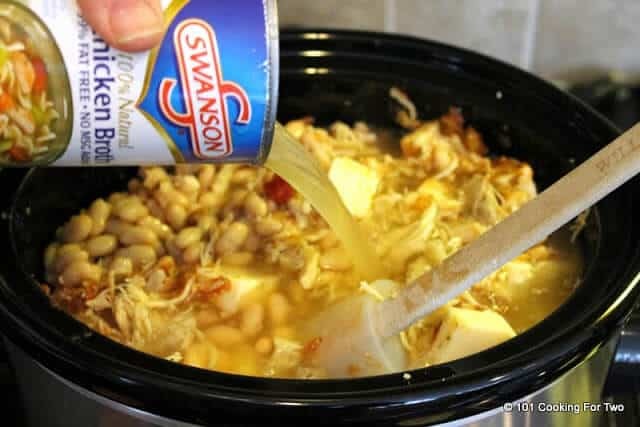 In a small (3.5 qt crock pot here) dump one 48 oz jar great northern beans (undrained), 8 oz of salsa, 3 cups of shredded chicken, 2 teaspoons cumin and 8 oz of pepper jack cheese (cubed). Add a 14 oz can of chicken broth if you want a normal thick chili. Leave it out for extra thick. Stir very well. Cook on low for 4 hours. Try to stir once or twice in the middle if you can to distribute the cheese, but it can wait until the end if needed. Get your chicken any way you want. I frequent will bake two skinless chicken breast at 350 for about 40 minutes until 165 degrees internal temperature. Rotisserie or leftover chicken works great. You will need about 3 cups. 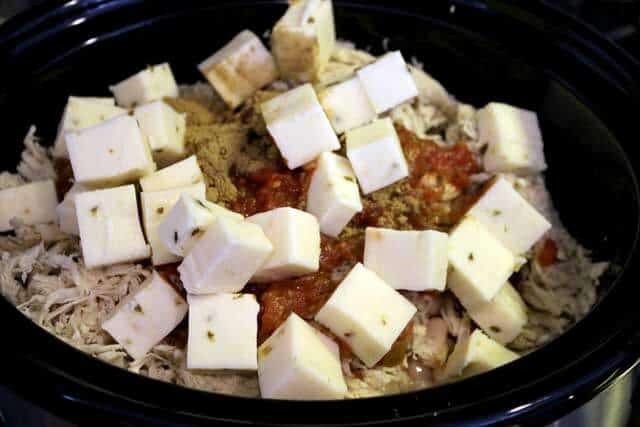 In a small (3.5 qt crock pot here) dump one 48 oz jar great northern beans (undrained), 8 oz of salsa, 3 cups of shredded chicken, 2 teaspoon cumin and 8 oz of pepper jack cheese (cubed). Cook on low for 4 hours. Try to stir once or twice in the middle if you can to distribute the cheese but it can wait until the end if needed. 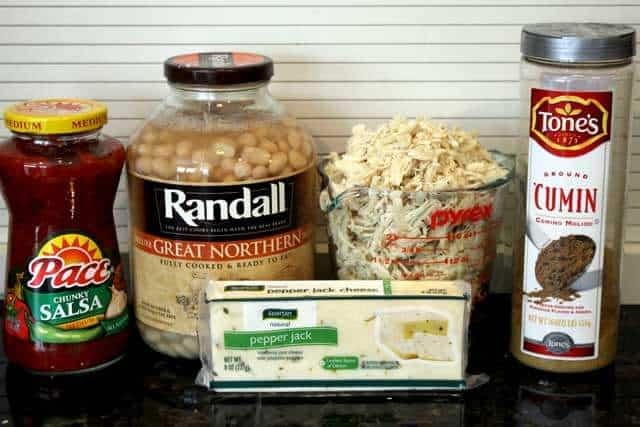 Adjust the heat by the type of salsa, and you can use Monterey Cheese instead of Monterrey Jake Cheese. You can also adjust the cumin to taste. As written, a 3.5 qt crock pot should be good but tight in a 3 qt. 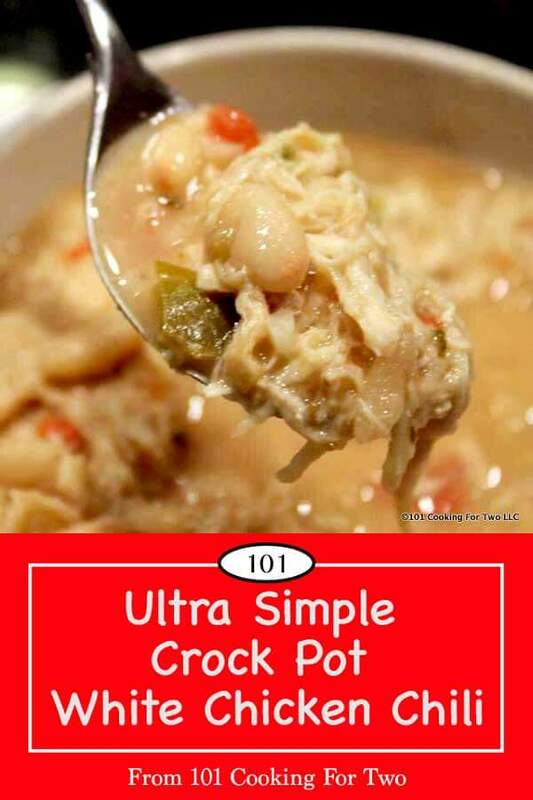 Doubles nicely in a large crock pot of 6.5 qt or more. Good in the refrigerator for 3-4 days. Good in a freezer for 2-3 months. Due to all the cheese, this stays hot a long time so great for tailgating and parties. Take copies of the recipe with you if you're taking it to a gathering. 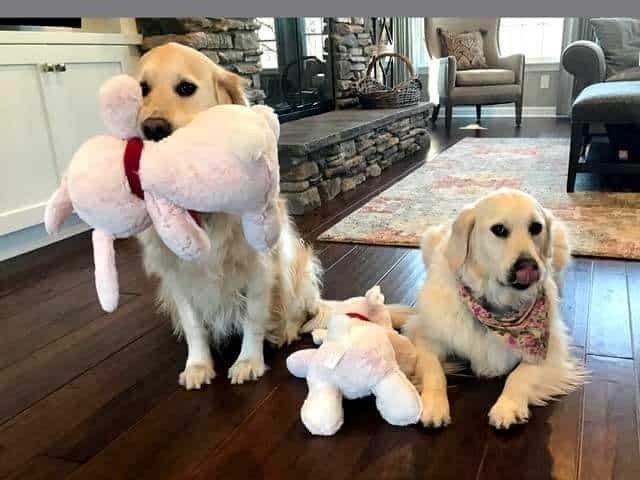 The Girls with their new bunny babies. OK, I hate when people change up recipes, but I don’t want to go to the store! Can I use black beans and salsa verde? I do have the correct cheese. I have made this recipe hundreds of time but I’m just not seeing the black beans as a good choice for the beans. The salsa verde would almost for sure be good although I haven’t tried it. I have another chili, https://www.101cookingfortwo.com/salsa-verde-white-chicken-chili-la-crock-pot/ , that I think black beans might be good in although I would probably just combine them with another bean. Maybe it is just me, I like black beans but probably not enough to have them by themselves in a chili. Thanks, I’ll go to the store! This was soooo good! You’re right, I don’t think black beans would’ve worked. Thanks! About how much of the sodium would you say is due to the extra broth? I ran the recipe through the updated calculator so you will notice some changes. To answer your questions, the broth would be about 170mg of sodium per serving. It will vary some by brand and there is zero sodium broth available now. About 1 1/2 cup assuming you don’t add the extra broth. With that 1/8 of the recipe is more like 1 3/4 cups. Could you use frozen boneless chicken breasts? Cooking frozen chicken has been reported to break ceramic inserts. 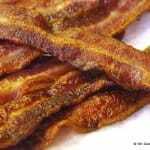 The FDA states it is a safety hazard with too long in the food danger zone of 40 to 140 degrees. 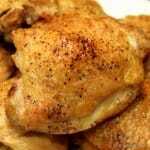 I have recipes where I cook raw chicken (not frozen) then remove in 3-4 hours to shred. Not good here due to the risk of burns from the cheese. So toss it on a tray and bake them for 35-45 minutes until 165 then shred.